class="page-template page-template-page-sections page-template-page-sections-php page page-id-269 samba_theme wpb-js-composer js-comp-ver-4.1 vc_responsive"
View our extensive range of floor coverings. Expert Advice + Quality Products + Professional Installation = Thrilled customers. 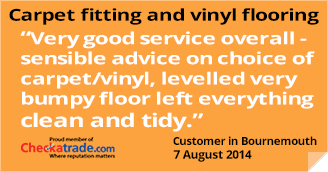 Professional advice for every floor surface to enhance your environment. As Bournemouth’s premier flooring specialists, Quality Carpets and Flooring have its showroom located at 1121 Christchurch Road, Boscombe East, Bournemouth, BH7 6BQ. Quality Carpets and Flooring, a family run business, delivers excellence to commercial and residential customers in Bournemouth and surrounding areas. 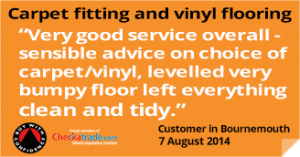 We provide a guaranteed professional and efficient service, whatever the flooring requirements. We will happily visit your premises or home to establish your requirements, advise in respect of the most suitable floor covering for each area required and supply you with a competitive no obligation quote. We pride ourselves in providing the expertise that will ensure our customers return to us time and time again.